Going to Gulfport to bring this home tomorrow. 2014 25' Airstream Flying Cloud. 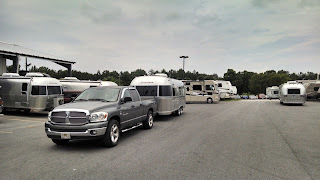 So, I asked my buddy Tom to go with me to Gulfport as he has experience with Airstreams. It was Tom and Robin who convinced us to go with the Airstream after we saw theirs. We fell in love with them immediately. So much more room than another brand that we were looking at. Part of the package that Foley RV included was a Blue Ox weight distributing hitch. This would prove to be the best hitch for the money. When the installer hitched the trailer to the truck, the back end dropped so much, I thought I was going to have to buy a new truck! But once they got the hitch adjusted, it was perfectly level. Our tow vehicle is a 2008 Dodge Ram 1500 with the Hemi engine. Seemed OK for now. Time will tell. The walkthrough went as planned and soon we were on the road back to Mobile. 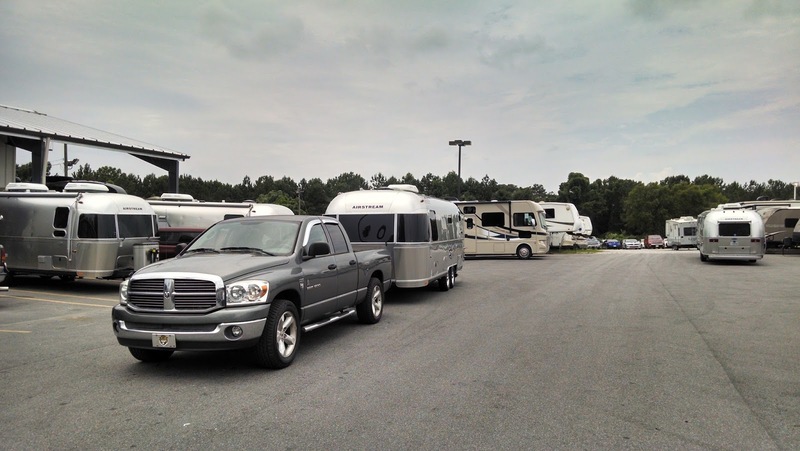 If you are in the market for an Airstream, I highly recommend Foley RV.